The Ikegami IK-DV3.4X3.8SA-SA1 Varifocal Lens from Fujifilm is a high image quality monitoring lens with optical performance supporting 3 MP resolution. It is compatible with a wide range of — 1/2", 1/3", and 1/4" — cameras. 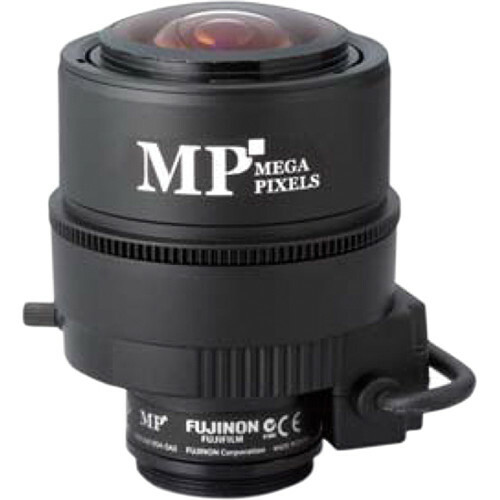 The wide f3.8 to13mm range supports various applications. This lens is designed with high-accuracy aspheric lens, low-dispersion glass, and high refractive-index glass to maximize optical performance. It has a built-in ND filter of T360 to allow support for high-sensitivity cameras. (*1) When power is turned off, iris will automatically close. Box Dimensions (LxWxH) 7.0 x 6.0 x 6.0"